Motivo Golf's StrikeDown Dual-Turf Pro golf hitting mats take your golf training experience to the next level. 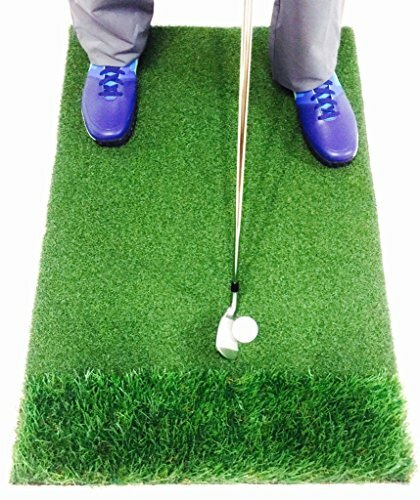 Only top performance hitting mats with realistic feel upon strike are capable of delivering the precise feedback needed to develop a golf swing that can effectively lower your scores. Our high-quality components deliver the exact feel and feedback you should expect from a professional grade golf hitting mat. This was achieved by combining our cutting-edge artificial turf with a thick and compressible shockpad that replicates real fairway and rough feedback during every strike. Suitable for indoor or outdoor use, the StrikeDown Dual-Turf Pro is perfect for practicing fairway and rough shots in the comfort of your home while saving you time and money on visits to your local driving range. Additionally, our smart shockpads protect your joints from the common elbow, shoulder, and wrists injuries caused by conventional golf mats and their rigid rubber bases. Begin your journey on achieving lower scores through smarter training equipment with Motivo Golf's StrikeDown Dual-Turf Pro golf hitting mats. REALISTIC FEEDBACK: Designed to develop consistency and confidence in your golf swing, the new StrikeDown Dual-Turf Pro is a perfect fit for golfers looking to find the performance and feel a golf mat should deliver. Our innovative SmartDivot technology ensures accurate fairway and rough feedback on every strike, providing valuable swing data that will help improve your skills and better your scores. FAIRWAY AND ROUGH: Experience the powerful benefit of practicing any part of your game from the fairway and rough. The StrikeDown Dual-Turf Pro's premium fairway and rough grass provides great energy transfer and extra-shock absorption that prevents clubs from bouncing during impact. BUILT-IN SHOCKPAD: Flexible and comfortable 5/8-inch thick shockpad base has a combination of air and elasticity, designed to decrease slide and increase stability while protecting your joints. The shockpad base also has a thermal coefficient that prevents weather induced deterioration. PRACTICE ANYWHERE: StrikeDown Dual-Turf Pro golf hitting mats are durable and portable. Suitable for indoor or outdoor use, you can increase your weekly training sessions by practicing everyday and anywhere. FREE TWO-DAY DELIVERY & FREE PRACTICE BALLS: Our free FedEx two-day shipping service allows you to start training with your new StrikeDown Dual-Turf Pro golf hitting mat in just two business days. Three (3) free indoor foam practice balls included.